4 bdrms, 3 bathrooms . Sleeps up to 8 people. Call if you have more than 8. The Kona Lighthouse is centrally located along the Gold Coast of the big Island, a 5 mile scenic, oceanfront drive between the towns of Kailua-Kona and Keauhou-Kona. The Lighthouse is ideal for family and group vacations. You are a block from White Sands Beach and across the street from the ocean. The new Magics Beach Grill is now open next to the beach. Enjoy the private lap pool in a lush tropical garden setting. This open and airy home (approx. 2400 square feet) has three lanai's (decks) each with ocean views. Enjoy cool ocean breezes flowing through the house night & day. Air conditioning in every bedroom, including studio. **** Wonderfully reasonable rates! The house is located in a peaceful residential neighborhood. The Kona Lighthouse: The Kona Lighthouse is centrally located along the Gold Coast of the big Island, a 5 miles scenic drive between the towns of Kailua-Kona and Keauhou-Kona. Keauhou, just a couple miles north, is home to many fine resort hotels and condominiums as well as a shopping center with 8 plex theater and many fine restaurants. A Spacious Vacation Home centrally located for all the fabulous activities Kona has to offer - snorkeling, kayaking, surfing, diving, hiking, shopping, dining and whale and dolphin watching, just to name a few. The Lighthouse is ideal for family and group vacations. You are a block from White Sands Beach (also called Magic Sands Beach) and two miles from world class ocean side golfing. Enjoy the private lap pool in a lush tropical garden setting. This spacious and comfortable house (approx. 2400 square feet) offers washer/ dryer, two cable TV's, WiFi, a large kitchen and living room and four lanai's (decks) each with ocean views. More on the Kona Lighthouse: Sleeping Arrangements: Master Bedroom with King Bed, Ocean View Bedroom with Queen Bed, Guest Bedroom with Queen Downstairs Studio has a Queen Bed & Twin . Cots and sleep mats on site. A reminder in case you didn't notice in the pictures, but there are quite a few steps to the pool and a winding staircase (with railings) that lead to the main house . The Kona Lighthouse is centrally located along the Gold Coast of the big Island, A 5 mile scenic drive between the towns of Kailua-Kona and Keauhou-Kona. Keauhou, just a couple miles south, is home to many fine resort hotels as well as a shopping center with 8 plex theater, super market and many fine restaurants and shops. Kailua-Kona, just a couple miles north, provides island style entertainment a shopping 'boardwalk' as well as Costco, WalMart, and the largest Safeway grocery store in the State. The Makalapua Shopping Center is home to K-Mart, Macy's and an 8-plex cinema. More on the Kona Lighthouse: Kailua-Kona is site of the Ironman Triathlon in October. The race starts and ends right in Kailua and runs all the way to Hawi, 1.5 hours to the north. Also about 1.5 hours north is Mauna Kea, the worlds premier celestial observation point. Over a dozen observatories sit atop the 14,000 foot mountain accessible by car except then there's snow! When there's snow you can rent ski's or snowboards and take a tour up the mountain in 4wd vehicles. Horseback riding is also available up the slopes of Hualalai Mountain, down into the picturesque Waipio Valley and around the mountains of Waimea town. Volcanoes National Park, with an ongoing active volcano, is just 1.5 hours to the south with some of the most amazing and unique scenery in the world. There are literally hundreds of things to do on the Big Island, and Kailua-Kona is the most centrally located staging point for all your vacation adventures. We can send you maps and brochures upon request!! Wendy Pritikin is your hostess. She has lived in Hawaii since 1987. She loves snorkeling, hiking, tennis and Hawaiian crafts, music, food and flowers. Harry Pritikin is your host and is also a Realtor and Broker In Charge at Kona Realty, Inc. He's been in Hawaii since 1978. He surfs, snorkels, and enjoys sharing his experiences and knowledge of the Big Island. The Kona Lighthouse is conveniently located between Keauhou-Kona and Kailua-Kona for your shopping and dining convenience. Also located across the street and just down a block from Magic Sands Beach; the only white sand beach in town. The new Magics Beach Grill now open next to the beach. The famous "Honu (turtle) Dive Beach" is directly across from the Lighthouse. Beautiful ocean views and frequent whale or dolphin sightings - as you lounge on the Lanai above the tropical pool setting with your friends and family - easy walk to Magic Sands Beach and short distance to Kahaluu snorkeling beach, Keauhou shopping center by car or by Kailua town shuttle. New Magics Beach Grill no open at Magic Sands Beach. Magic Sands beach just a block and a half away. Easy walk. The only white sand beach in town. Lots of fun to shop for souvenirs , various parades and special events, now famous Ironman Lava Java restaurant along with many other fun and ocean fun restaurants. 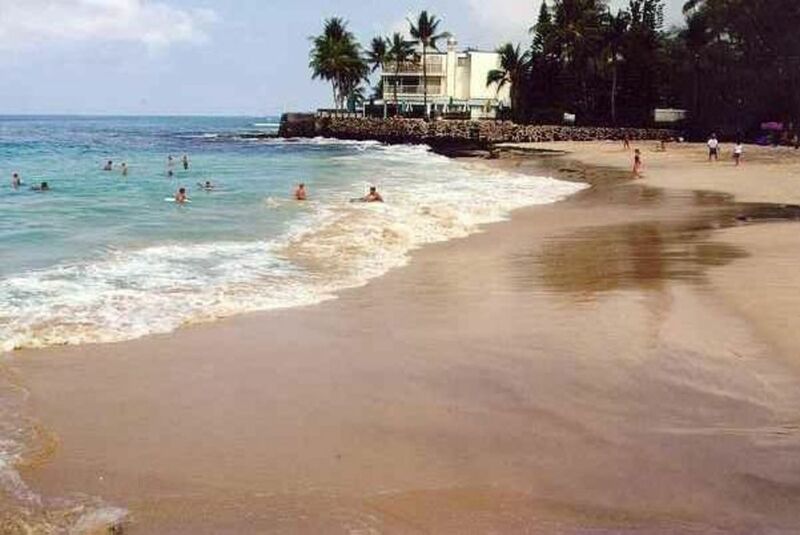 Directly across the street is the famous "Honu Dive Beach" a block north and easy walk is Magic Sands Beach. A mile south is Kahaluu Beach great for snorkeling and surf lessons! Kailua Village - fun shopping and cute little restaurants. Keahou shopping center is just 2 miles south with movie theatre, grocery shopping and restaurants - a great Sat morning farmers market! Across the street and one lot back from the ocean, you can see waves crashing on shore and surfers catching waves from the lanai. Across the street from the ocean. See Lighthouse photos. Unobscructced coastline/ocean/horizon view. You can see/hear the waves crashing on the shoreline. Best new restaurant & bar is Magics Beach Grill on the water next to Magic Sands Beach. Just a block and a half from the Kona Lighthouse. Unlimited free long distance to the mainland USA (but not foreign countries). Blankets too! And beach towels. Everything you need!! (2) 2 dryers in garage. 2 cars will fit, one is better. (2) One in upstairs kithen, 1/4 size in downstairs studio. (2) Upstairs kitchen and downstairs studio. (4) Upstairs wrap around deck, downstairs studio private lanai, upstairs master bedroom private lanai, pool deck. 36 foot lap pool 4 feet deep. The Lighthouse comes with paper towels and toilet paper. But we do not replace what you run out of. There is one refrigerator in the upstairs kitchen and smaller refrigerator in downstairs studio. There are also towels & wash clothes, beach towels, sheets, pillows, pillow cases and blankets. Washer & dryer downstairs In the garage are coolers, boogie boards, masks, snorkels, fins, beach chairs, etc. Please replace what you break or lose. Dining area is on the outside lanai with two tables seating eight and a breakfast bar seating two. There is seating for four inside at two breakfast bars for a total of 14 seats. Downstairs studio has private lanai with table seating for two. Inside kitchenette has small fridge, sink and microwave. Studio also has it's own TV and VCR/DVD. Other Activities: Whale watching. Swim with the dolphins at the Hilton. Golf: Some of the finest golf courses in the world are located on the Big Island. There is a public course called the Big Island Country Club just up the street in Keauhou. Up north the public course is in Waikoloa Village. All the big resorts up north have world class golf courses. Ski: When there is snow on Mauna Kea you can rent skis & snowboards in Hilo and hire a 4WD vehicle to take you to the top. You ski down and the vehicle drives down to pick you up and take you back up. You can even use boogie boards or inner tubes to slide down the mountain.